Whether you own a small Bed and Breakfast or run a national chain hotel or resort, fitting your entire staff into top quality hotel uniforms sets a professional atmosphere for both employees and guests. Even better, Uniform Solutions For You offers FREE consultations with our “uniform experts” to help you brainstorm on your desired uniform look. We know how frustrating it is to wait on hold on an automated system. With us, you will talk to an actual representative that will able to assist you through your specific uniform needs. Whether it be front desk blouses, housekeeping attire, blazers for your valet and bellman, or smocks for your spa staff, Uniform Solutions For You will help guide you in the right direction, even helping you generate hotel uniform ideas! If there is one thing guests take with them, it is the appearance of your staff and your establishment. Let us help you design a unique and distinctive uniform program to help make your guests stay unforgettable. You can never redo a first impression. We know one of the first things your guests notice is the appearance of your front desk staff. Why not put them in a professional and unique uniform to compliment your image? The dining experience for your guests should be just as comfortable as your hotel accommodations. Make them feel extra relaxed during their stay by dining and interacting with your restaurant staff who, of course, will greet them in a great looking uniform. 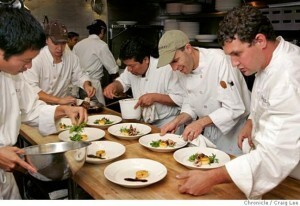 Even your back of the house staff (kitchen staff and others) set the stage for a professional restaurant or hotel. We know how chefs are perfectionists so why not make them look perfect in our cool and contemporary chef apparel along with their name and your logo on their coats? We also understand the kitchen can be an uncomfortable work environment so we encourage you to check out our breathable but comfortable kitchen staff uniforms. Reach out to one of our uniform consultants for ideas about kitchen staff uniforms and samples. Housekeeping and hotel maid service is demanding work. We make it easy for you by outfitting your staff in comfortable but sharp looking housekeeping and maid uniforms that compliments your establishment. Our selection of hotel and front desk uniform shirts options offer contemporary styles, a great variety of colors, functionality and ease of care. These shirt options don’t end at our site as over the years we have partnered with over 200 shirt suppliers which allows us to offer and endless array of quality hotel and front desk uniform shirts. We know it is important to our customers that the shirt style, color, and size is available year round and our selection reflects this. Your staff at the front desk is one of the first impressions your guests receive in arriving at your property. 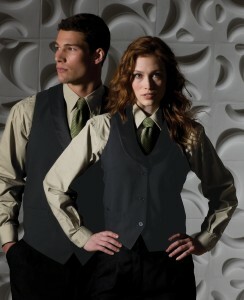 Outfitting them in sharp looking vests adds class and professionalism to your operation. Adding your logo is a nice touch as well. Please allow us to create a price quotation for you to consider. Finish the look of your front desk staff with our form fitting and affordable blazers and sweaters. The new fabrics we offer are machine washable yet look like a dry clean finish when worn and they pay for themselves in reduced dry cleaning bills. Please contact and request a sample for your evaluation.